Close proximity to Kitchen and the outdoors. Phone accessible. Internet internessible. 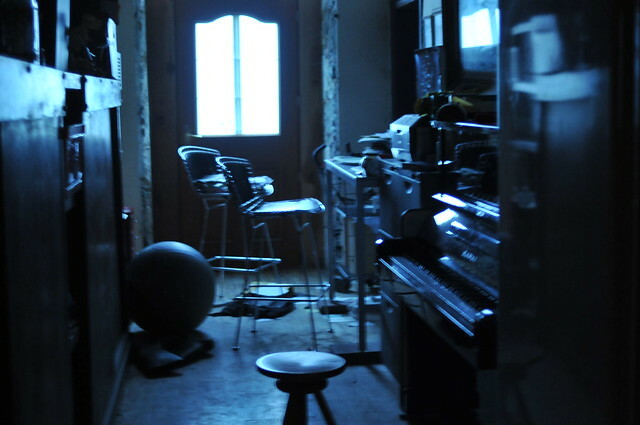 Piano, bouncy ball, fancy chairs. Photocopy, fridgebox, dinner table. Yeah, a farmer’s wife doesn’t just wife … she farms … we know that. Because there is so much to do. So much so, we employ child fambly labor to get the chooks done or move shtuff or help with the cows. And the sales. And the delivery. It’s all part of moving things forward. We call on friends. Friends help us when two is not enough, we need the third man for our annual “check all the cows” day. Thanks g-Friend! The office looks calm, but we are sold out. I like the bouncy ball. Lovely tranquil light… I bet it’s a bit different when you’re in full swing in there! It’s nice when the door is open. I feel like I’m outside. NO! Your space is comforting and calm!!! And clean! What a fun photo project! You have a sensible place to write! the wifi doesn’t go through the thick walls, so I needed to put the desk by the opening to the hotbox. Turns out, it’s next to the front door, which turned out to be a perk. May as well be accessible… saves everyone looking for you. so true. when I need to hide, I grab a glass of wine and sit in the field making sure the herd is where they should be. Right in the heart of the action. Busy but ideal for your busy life. I can cook, write, fix fairy wings, greet customers and support Brent in the field all at the same time! Now that looks like a real WORK space. No fluffing around there. If you are farming, parenting, writing and have a dog, You have 6 full time jobs. Husbands are 2 full time jobs. It’s good you get help when needed. Love the access to outside. we have a helpful community here. everyone is happy to help out when needed and we return help as well. I must admit the central location has improved my ability to keep up with orders and customers.